My test pieces looked anodized but they wouldn’t take dye. Yay! It has some water spots, but I can polish that up. – This was a tough one for me. There are steps in the anodizing process that are a mystery. I still don’t really understand how to figure out the voltage level based on the size of the piece. Fortunately I brought my husband with me today to help with the math. – Sometimes equipment just fails for no reason. The two failed test pieces and the successful plate were from the same canteen set, so there was really no difference between tonight’s try and January’s. It just so happens that tonight’s worked. – I probably won’t be anodizing whole sets of pots and pans. We also made most of the box for project 23 tonight but I didn’t buy the hardware I needed. I’ll finish that soon and show you the completed project. Then I’ll be all caught up and can concentrate on project 24. Remember project 4? How about project 17? And who could forget last week’s unfinished jewelry box? This week I am going to do my best to finish (or in the case of the planets at least make some coasters) all of these projects. Wish me luck! If you didn’t come to MakerFaire in Raleigh this weekend you missed a great time! I met lots of people doing interesting things, many of which I’ll be sharing with you as the weeks go by. For now, check out my kindred spirit Dino at Hack A Week. I will definitely be keeping an eye on what he’s up to for the rest of his project! I’m including this photo to show that anodizing really does work. This test piece is from the class I took several months ago. It used to be a shiny aluminum rectangle, and now it’s dark blue. I’m bummed that I didn’t end the week with bright pink cookware, but I know how I could do better next time. I’m going to try to anodize my pots again later in the year. – The theme of this week was lack of preparation. I didn’t have enough dye, I didn’t find the final pieces I wanted to anodize, and I didn’t leave myself enough time to do everything I needed to do. All of these together added to failure. – I need to learn more about how to calculate the electrical settings before next time. I also need to learn how to choose the right aluminum pieces so that I can narrow down my problems when the pieces fail. Right now it’s all still a big mystery. – Anodizing is still awesome, even if I didn’t get much of a chance to show you that this week. I hope you’ll join me in a few months when I have another chance to try. Next week: a recovery project. Maybe some paper folding. I’m looking forward to getting my confidence back! After yesterday’s utter failure to anodize and dye my test pieces, I took a moment to source the kinds of cookware I hope to anodize for my final project piece. Unfortunately, I really didn’t leave myself enough time this week to shop as thoroughly as I need. I ran to a department store that the internet had suggested might have plain aluminum cookware, but they didn’t have anything I could use. I ran quickly through one more store on my way to another obligation and still turned up nothing. At this point I’m afraid I’m not going to be successful with this week’s project. I’ll make one more status update tomorrow and figure out where I can go from here. Thanks for your patience. Yesterday was anodizing day, at least for my test pieces. I brought my husband along to help me with the math. I don’t fully understand electricity yet and so I thought it would be wise to have some help. I got all suited up in my safety gear and prepared my two test pieces for anodization. First I secured the conductive wire to my pieces. Then I lowered the pieces into the bucket of sulfuric acid and connected the wire to the metal plate. Using my husband’s calculations, we set the amperage to the settings I needed and walked away for an hour. It was at this point that I realized I hadn’t bought enough dye. So my husband set out to find more Rit Dye at 9pm. He eventually found some, but not the colors that I wanted. I settled on a couple of other shades of pink and he returned just as the timer was running out on our acid bath. The pieces looked promising. Anodized aluminum turns from a shiny metal to a light gray matte, and these pieces looked great. I carefully removed them from the bucket and rinsed them under a lot of water. 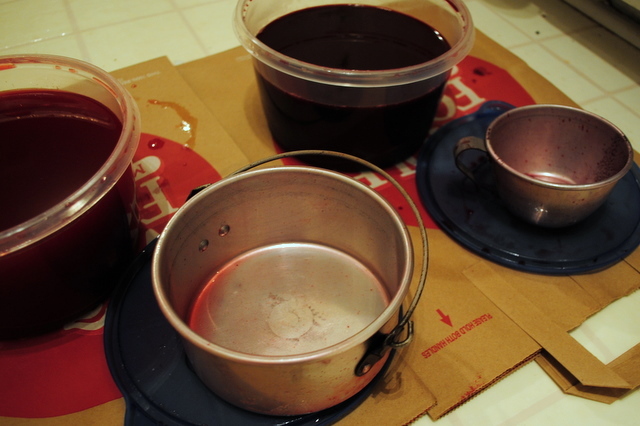 We mixed up the dye in two smallish containers, one color per container, and settled the pieces in for a soak. They hadn’t taken up any color at all! I don’t know what went wrong and I’m beyond frustrated, but I’ll bring them back to TechShop tomorrow and try again. Project 4: What to anodize? This is an aluminum cap catcher like you would hang under your bottle cap opener. He wanted me to try dying it red as a test for the local homebrew supply store. One fun thing about anodizing, aside from getting to dye metal colors, is that the anodization can be etched. This means that something metal like this cap catcher could be branded in a more visible way than just etching the metal itself. So I tried anodizing it. Basically what you do is hang the metal object into a bucket of sulfuric acid with a current running to it via a conductive wire. When the anodization is done the metal is porous and will pick up regular laundry dye. At least that is the theory. For this particular piece I was having no luck getting the anodization to work. It turns out that the cap catcher is coated in a way that makes the metal not conduct electricity. Since the electricity is a vital part of the process, the anodization didn’t work. I hope my canteen set is the right kind of aluminum! Check back tomorrow to see my results. This week I’m going to anodize some aluminum cookware and dye it bright pink. I have been wanting to do this ever since I first found out that anodizing was something that one could do at home. For this project I’m going to do it at TechShop where the anodizing rig is already set up. Join me as I learn about anodization, source some plain aluminum cookware, and probably run a few test batches. Hopefully I’ll have time before Friday to test the pans for color fastness while cooking.